I have always loved waterfalls and I can’t really explain why. Presuming there was some explanation to be found on the internet, I tried Googling it, but alas there was no clear cut reason to be found, despite the question being asked many times before. World of Waterfalls gives quite a detailed account of why they believe many people have a fascination with falling water, and I have to agree with much of the reasoning: the uniqueness, omnipresence, natural beauty and health benefits of waterfalls. 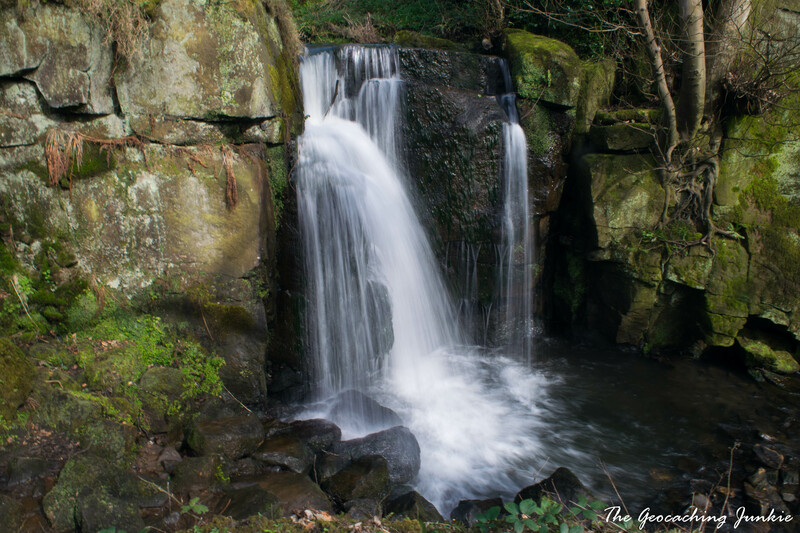 My little bit of research also uncovered that the ancient Celts believed waterfalls were portals to the ‘Other World’, where spirits lived. 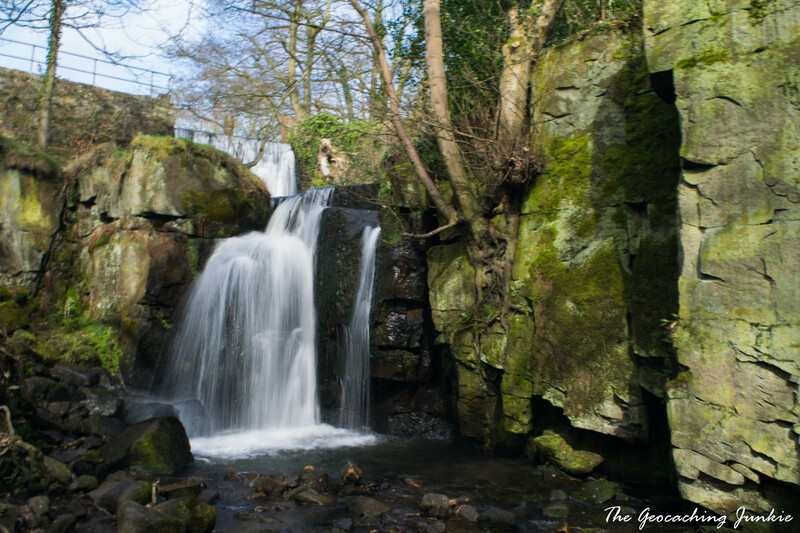 I don’t know about that, but I do know that watching waterfalls makes me inexplicably happy and I will gladly spend endless time sitting beside them and taking photographs. Since I make regular trips to visit my future in-laws in Matlock, Derbyshire, moan-a-lot recommended I look for GCVH65, Arkwright’s Store. He didn’t tell me anything other than the cache was ‘up my street’. He was right! 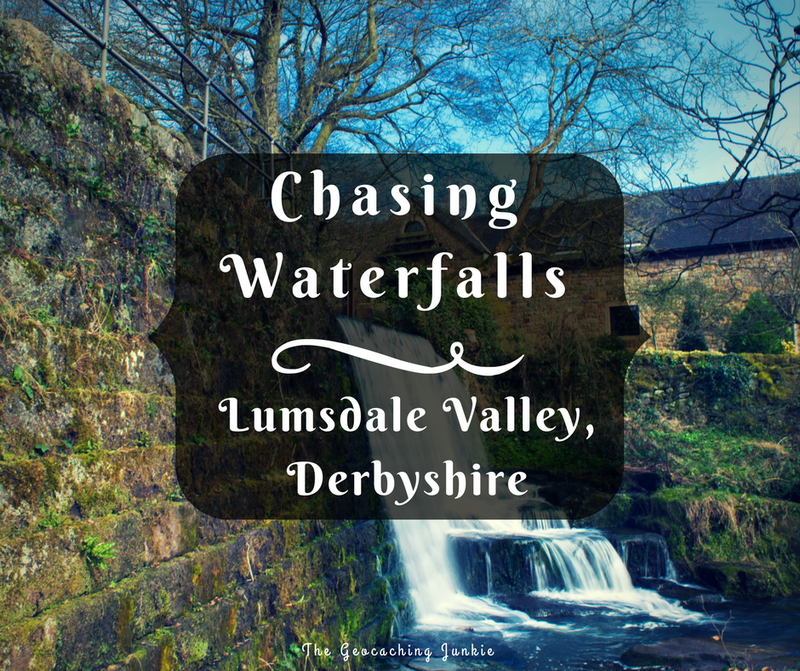 The cache is located in Lumsdale Valley, a narrow gorge with several waterfalls, pools and ruins of buildings once used when there was a watermill here. 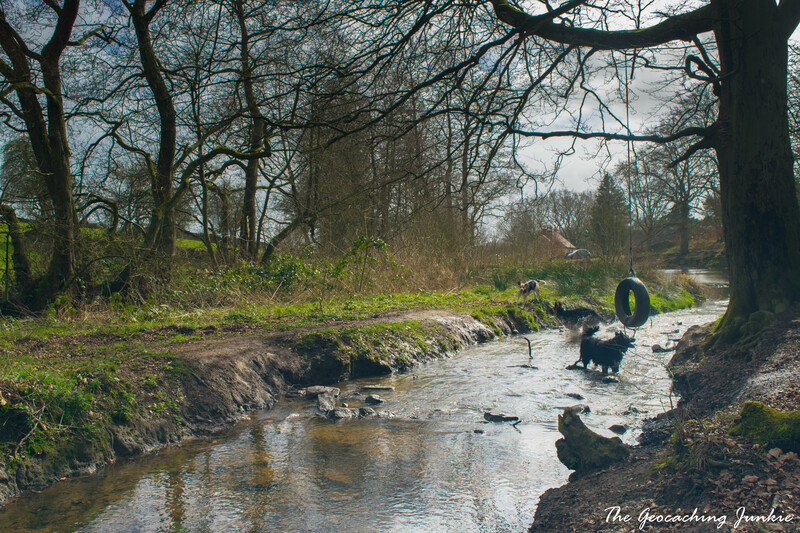 Our walk started along Bentley Brook, where I couldn’t resist the stepping stones! 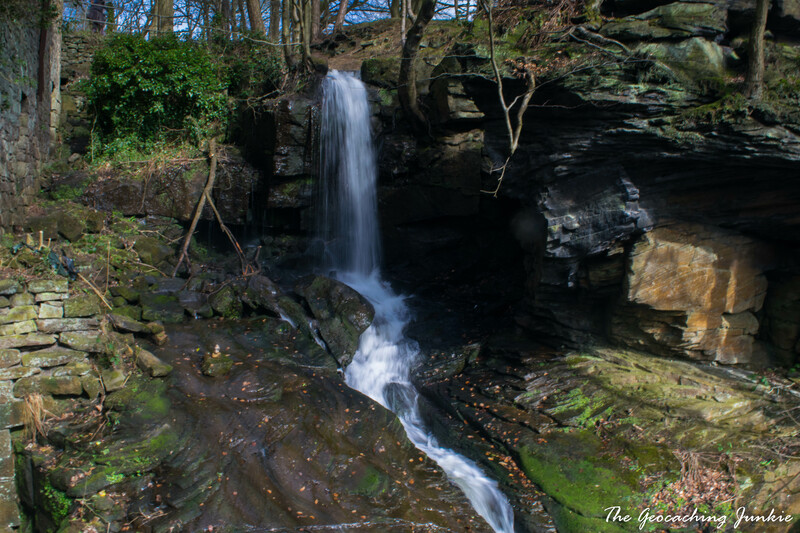 Falling Water – My Favourite! I wasn’t really sure what to expect but we arrived at a waterfall and I thought that was all there was to see. Don’t get me wrong, it was enough, but I had no idea that we were standing at the top of a gorge that would gift us lots of photo ops as we made our way to the cache. 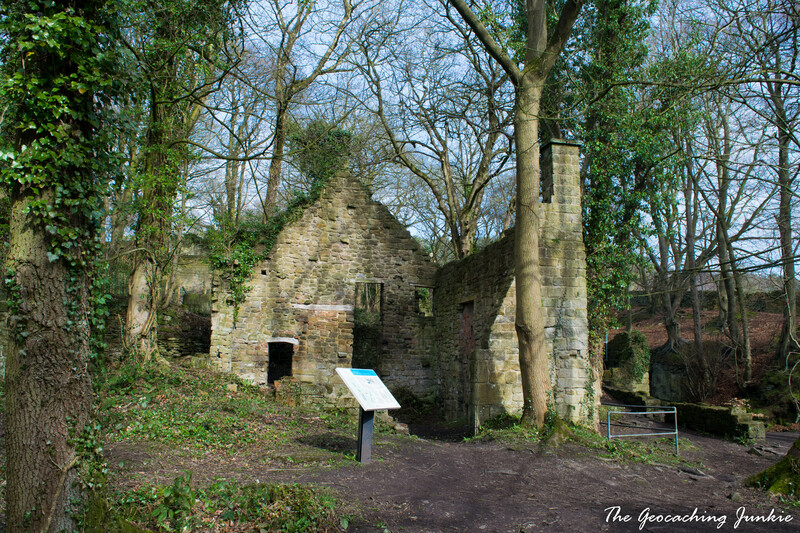 The site is owned by the Arkwright Society, a charity dedicated to the conservation of industrial monuments in Derbyshire and named after Sir Richard Arkwright, who founded the world’s first water-powered mill in nearby Cromford in 1771. Not knowing exactly what to expect, I thought the best was done when we hit the first waterfall. 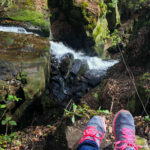 Little did I know there was a veritable treasure trove of hidden nooks and crannies with waterfalls of varying sizes still to be discovered! 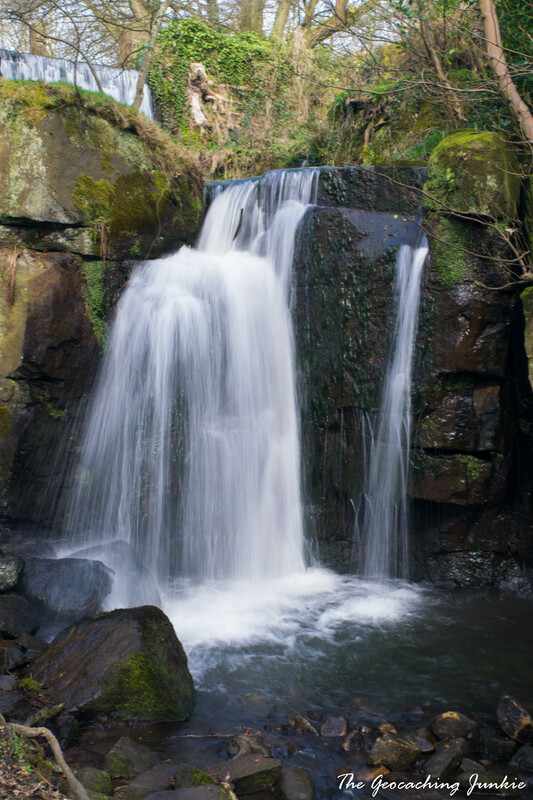 Lumsdale Valley is considered ‘one of the best examples of a water-powered industrial archaeological site in Great Britain‘. I didn’t realise I was being brought to such an amazing location when I set out to find this cache. The lay of the land was such that the hardest part was figuring out what level we needed to be at and I turned a T2.5 into a T4 by searching at the wrong spot. We finally righted ourselves and I spied the cache tucked away. 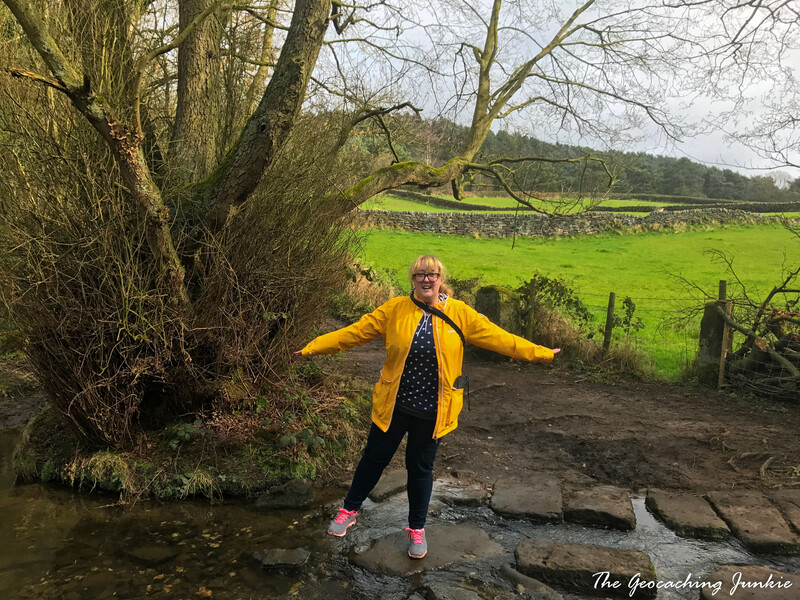 We had to wait out a couple of muggles though, one of whom wanted to get to the other side of the falls but underestimated the depth of the water with hilarious results – and one very wet foot on the drive home I’m assuming! 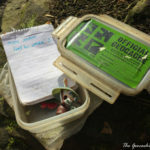 This cache was the perfect example of quality over quantity: we found just two caches in the area but I still consider it an exceptional day of geocaching due to the breathtaking location. 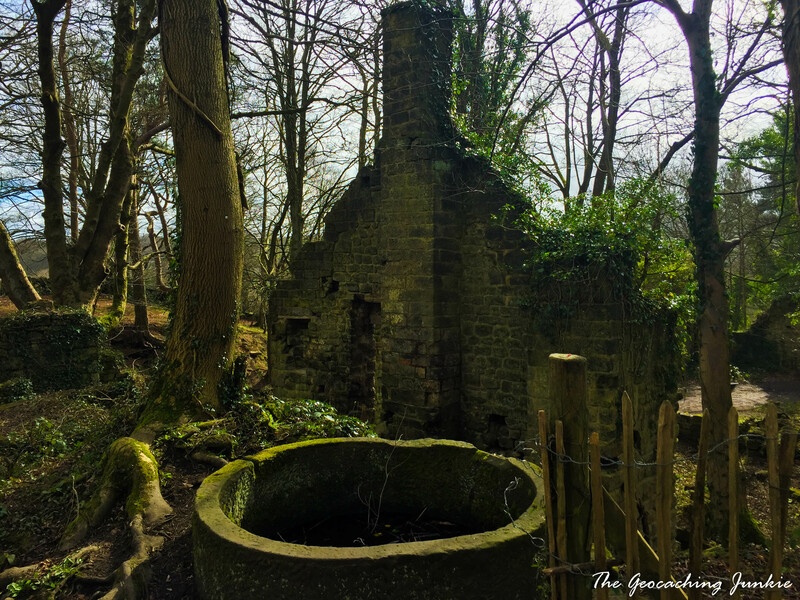 If you want a longer walk, you can park in Matlock or Tansley and follow the coordinates to the cache, which will get you there along wooded trails. 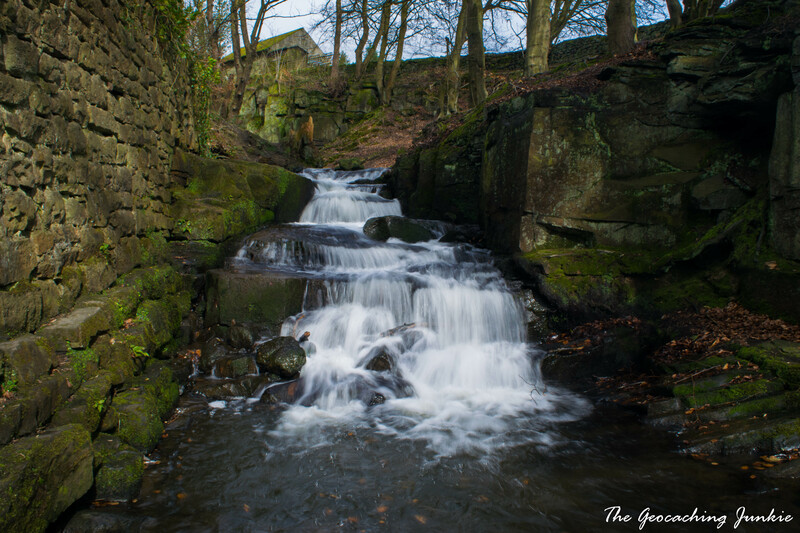 We went for the shorter route, parking near Highfields School (N 53° 08.836 W 001° 32.099) and taking a leisurely stroll to the highest point of the gorge, before making our way down the various sets of steps. Buses from Matlock and Chesterfield will leave you on the road near the school. 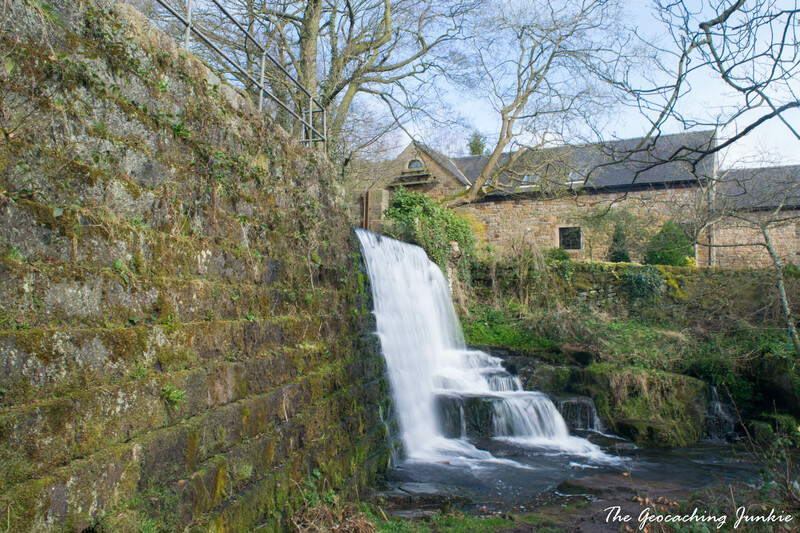 The walk here is worth doing for two reasons: obviously, the picturesque waterfalls that I’m drawn to so much on, but also the industrial archaeology in the various stone ruins, which somehow adds to the romantic decay of the area. 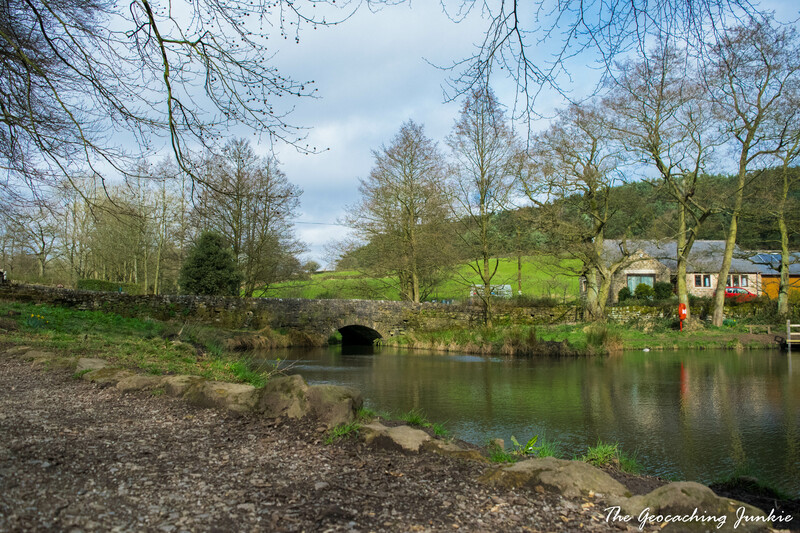 The Arkwright Society offers two hour guided tours of the valley on the last Sunday of each month between March and October, which will give a better insight in to the fascinating history of the area. 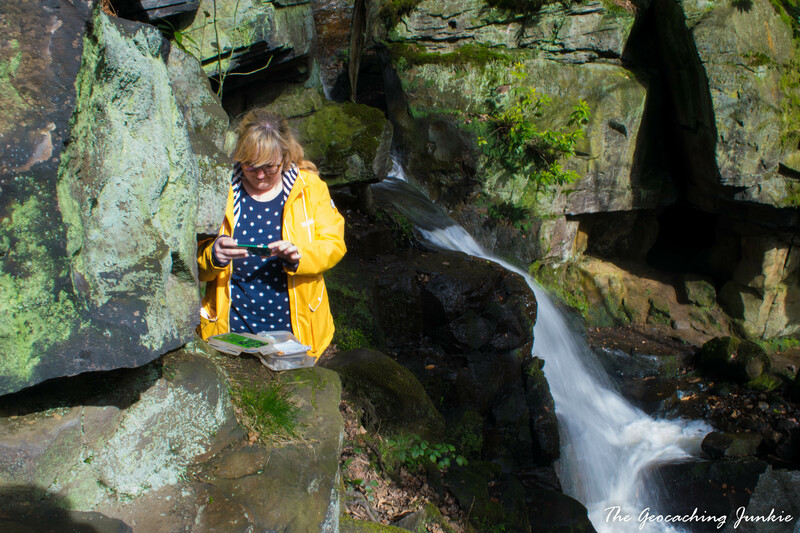 Do you enjoy uncovering waterfalls when you’re geocaching? Where is your favourite? Let me know in the comments! Looks awesome! Glad it’s not just me who often manages to notch up the T rating unnecessarily. ? It was ridiculous! I was so close to falling in ?